Port Grimaud is one of the most charming towns you’ll find along the coastline of French Riviera. It’s so easy to fall in love with this place, filled with a myriad of colorful houses overlooking the water, beautiful bridges and picturesque alleys. 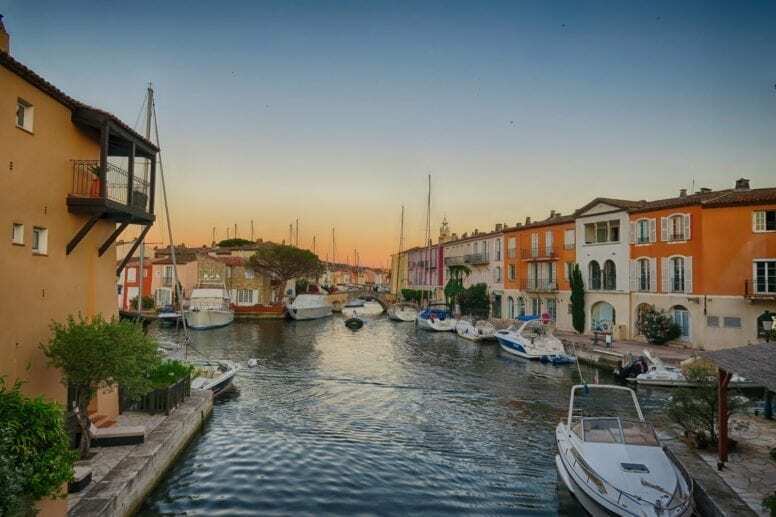 Because it is home to so many canals, Port Grimaud is often called “Little Venice of France” and we confirm, that although much smaller in size, it is as romantic as the famous Italian city. It is also closed to all non-pedestrian traffic which means you can enjoy long, peaceful walks and breath pollution-free air. If you’re planning a holiday in Côte d’Azur, Port Grimaud makes a perfect location for relaxing on the beach and for exploring other beautiful towns nearby. 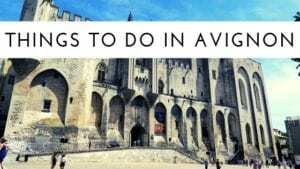 It also offers quite a choice of fun activities and interesting attractions and if you want to pack as much as possible into your holiday check out our recommendations below. 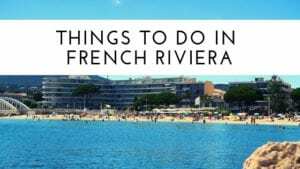 So, without further ado, here is our list of the best things to do in Port Grimaud. Why just admire the waters from land when you can actually hire a boat and see the town from a whole new perspective? 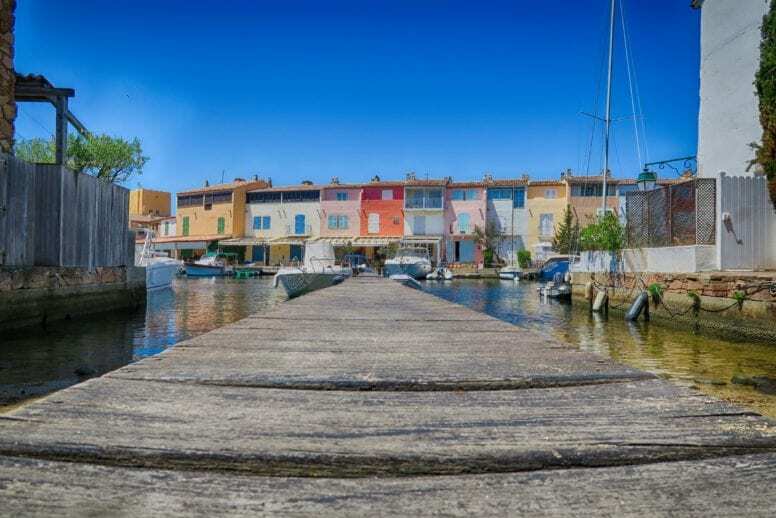 Hiring a boat in Port Grimaud is a fun experience that will let you explore hidden corners of this picturesque town and fill up on the sun and amazing views. 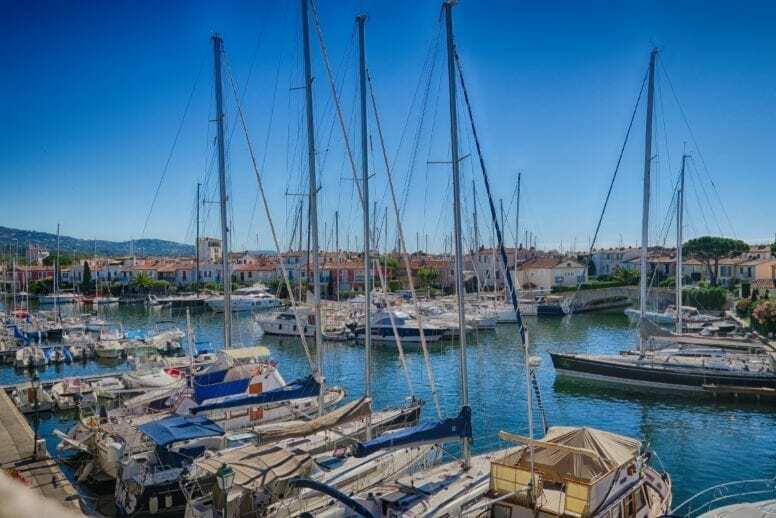 How to Hire a Boat in Port Grimaud? 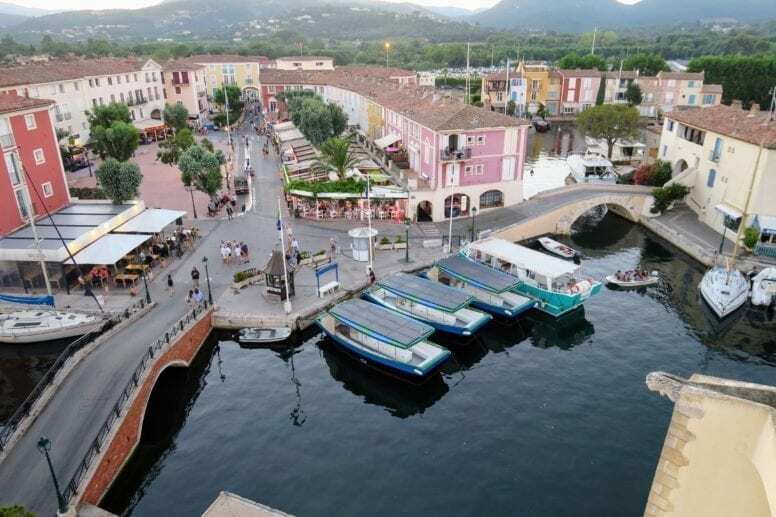 Port Grimaud offers many different options and depending on your time, budget and experience you can be the captain of your own ship or pay someone to take you around. It is possible to rent a small boat for two people just for 20 minutes or a big luxury yacht for a group of friends and spend up big time. One of the easiest options available which doesn’t need a whole lot of planning and skills is renting a boat that doesn’t require a license. There are electric boat rentals available that will let you spend spontaneous 30 minutes out on the water without a driving permit. Head to one of the travel agencies in Port Grimaud where they’ll help you choose the best option for you. Church of Saint Francis of Assisi is an important historical point of interest and a must-see on our list of things to do in Port Grimaud. It is an ecumenical church which means it represents a number of different Christian Churches so make sure to respect the liturgical services when you plan to visit inside. Both, interior and exterior of this church are pretty simple except for the beautiful stained glass created by the Hungarian-French artist Victor Vasarely. François Spoerry – the architect who greatly contributed to the creation of Port Grimaud is buried at the church of Saint Francis of Assisi. At a symbolical cost of 1 euro, you can go all the way up to the bell tower, where you will enjoy an amazing panoramic view of Port Grimaud. This is one of the best spots in the entire town to snap beautiful pictures for your holiday photo album. Saint-Tropez, one of the most beautiful towns in French Riviera is located only 15 minutes away from Port Grimaud. This means you can go and visit it anytime you want and spend an entire day or just a few hours there. 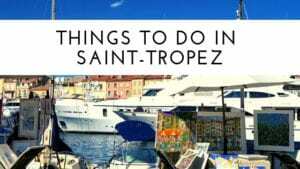 One way to reach Saint-Tropez is by car, but given the heavy traffic in the area, going by boat is way faster and more convenient. Not only it will save you time but also give you an opportunity to enjoy amazing views on the way there. 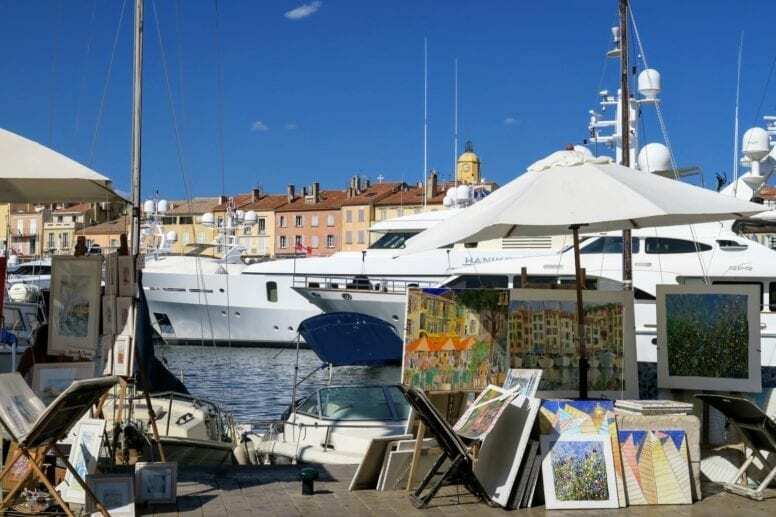 There are taxi boats departing frequently from Port-Grimaud Capitainerie (especially in high season, starting in early April) and it will take around 20-30 minutes to reach Saint-Tropez. Once there you can enjoy all the points of interest this glamourous town has to offer. Designer boutiques, narrow cobblestone streets and of course the famous harbor filled with yachts are only some of the attractions available in this charming place. The best way to make the most of Saint-Tropez is by walking so remember to wear comfy shoes and to bring your camera – amazing photo opportunities are waiting for you around every corner. 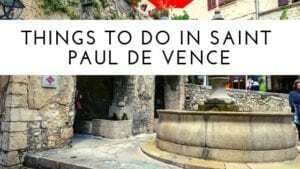 Insider Tip: if you want to explore other amazing locations near Port Grimaud, check out our article about things to do in Saint-Paul de Vence and also our Avignon guide – two beautiful towns filled with attractions. You can also take a day-trip to the artistic town of Aix-en-Provence and to the gorgeous Porquerolles Island. Not far from Port Grimaud lies one of the most entertaining attractions of the area – the Azur Park. Azur Park is an amusement park loved by children and adults, filled with a myriad of attractions that will keep your family busy for a whole day. Smaller kids can enjoy the spinning rides, trains, carousels and car chasing while the adults will have fun on the frightening sky riders and ejection seats. All of the golf enthusiasts will be thrilled to know that there is a “Tropical Golf” Station available as well, where you can enjoy your favorite sport surrounded by dinosaurs. You can end your day at Azur Park with a lovely dinner at La Rotisserie restaurant where you can enjoy great food in a fun setting. Ticket Price: For rates and discounts check the official website of Azur Park. Port Grimaud is an ideal place for anyone who wants to relax because it features its own beautiful sandy beach. Plage de Grimaud is a free beach and has free public showers and toilet facilities and although it is pretty popular with both tourists and residents, it hardly ever gets too noisy or overcrowded. 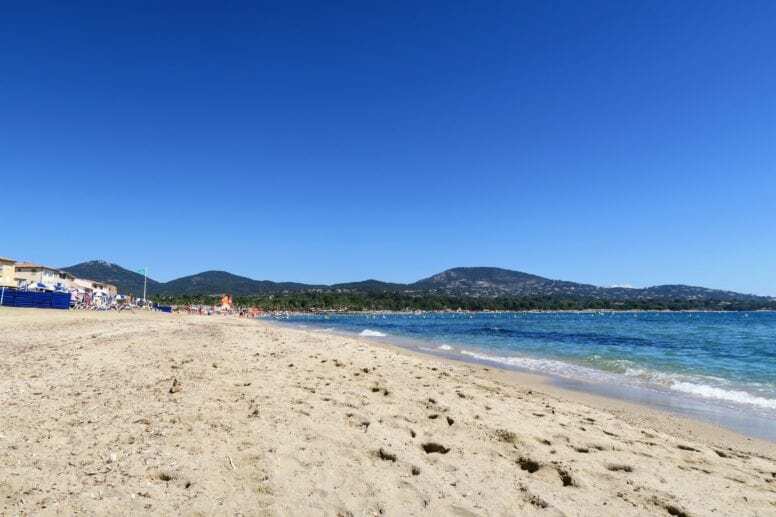 Even in the high season, the beach still feels somewhat quiet so you can sit back, read your book and recharge on the much needed Vitamin D.
The emerald waters at the Grimaud Beach are warm, clean and shallow for quite a distance so they are perfect for kids or anyone learning to swim. There is also a small bar/restaurant available at the beach where you can have lunch and buy drinks or ice cream. Not far from Port Grimaud lies Massif des Maures – a mountain range, ideal for anyone who loves hiking and spending time surrounded by nature. It is situated between the cities of Hyères and Fréjus and its name can be translated as “black mountains”, which refers to the dark colors of rocks and of dense forests. Also, one of the theories says that the name originates from “the Moors” (aka Muslims) who came to the region in the 8th century. If you hike in the Massif des Maures you’ll be surrounded by rich vegetation, trees, flowers and all kinds of plants. You will also come across many species of animals and birds such as swifts, jackdaws, yellow-legged gulls or peregrine falcons. 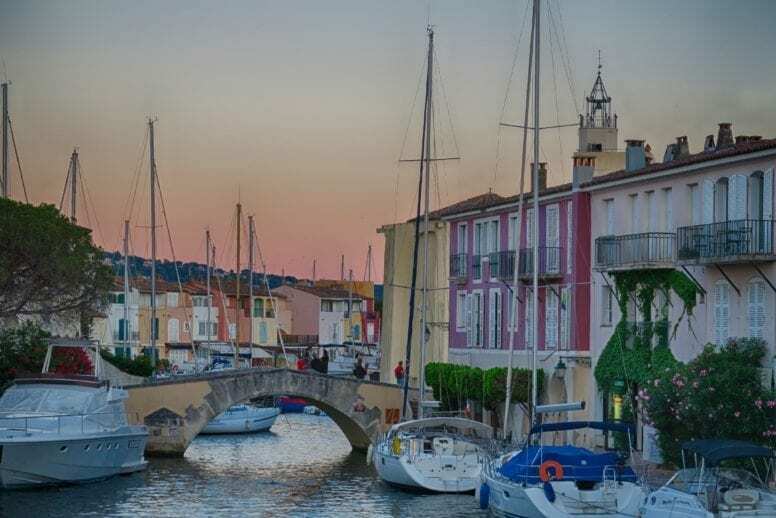 Spending some time in this place comes highly recommended on our list of things to do in Port Grimaud – amazing views are guaranteed plus your lungs will fill up with clean air. 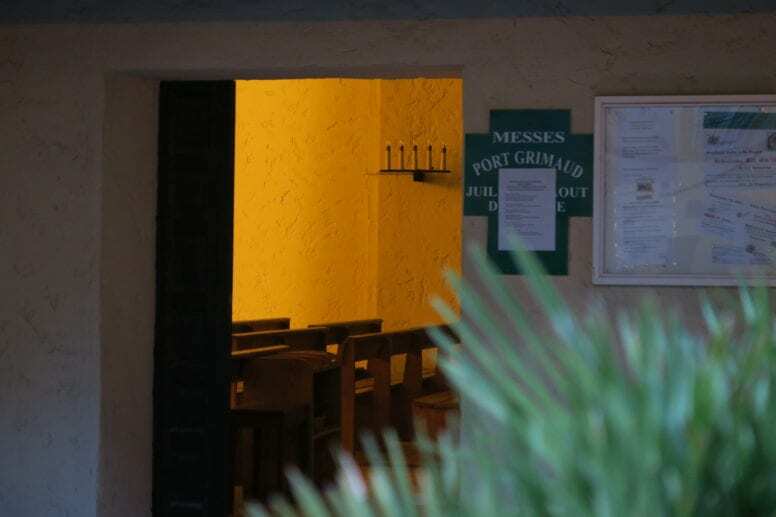 In the Grimaud Village lies another interesting point worth visiting – the historic church Eglise Saint Michel. This simple, yet beautiful place of worship dates back to the 11th century and contains a wonderful golden statue of St Michel slaying a dragon together with St Peter and St Bartholomew. While visiting the church make sure to look upwards where you’ll be able to admire the carved frescoes of the three Saints. On the external facade of the church, there’s also a well noticeable sundial to track the time and date based on the position of the sun. The Heritage Museum is one of the most charming museums you’ll ever see so make sure to visit it during your holiday in Port Grimaud. It is a perfect place to learn about the history of this small town and about people’s lives that in the past revolved mainly around agriculture. In the museum, that comes in the form of a 19th-century farmer’s house you’ll get to see a selection of objects and tools used in their everyday lives. Massif of Tanneron is an extraordinary place covered with beautiful forests of mimosa flowers. You can spend hours walking around this area, admire the stunning panorama and nature around you. Depending on when you’re coming, you’ll get to witness different stages of growth of mimosa flower. If you want to see them in full bloom you should visit the Massif of Tanneron at the beginning of the year when it becomes bright yellow and the air fills up with an amazing scent. Remember to bring your camera along since this area overflows with colorful insta-worthy locations. Port Grimaud offers a variety of options for shopping and purchasing local specialties. 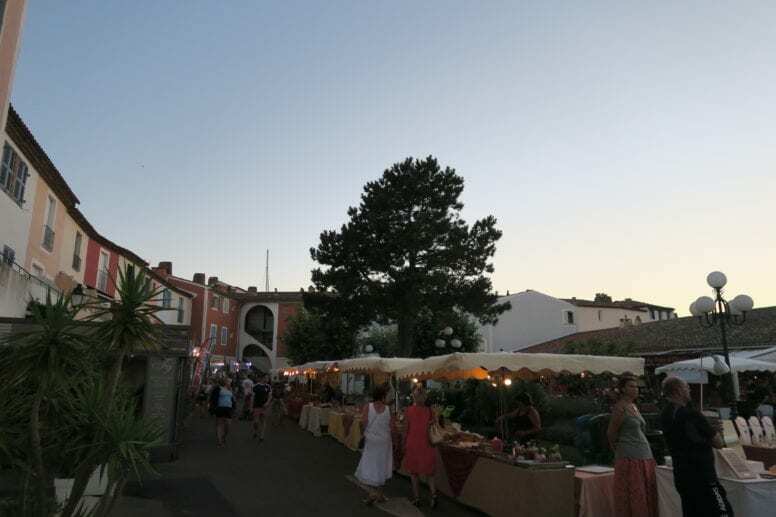 The Market day is every Thursday and Sunday in Port Grimaud, while every Thursday in Grimaud Village – both all year long. While the unique Night Market happens every Monday during summer time – starting from July 2 to August 27 between 5 pm and 11 pm. The location is very convenient since it’s right in the center of Port Grimaud so it’s easily accessible by foot from everywhere in town. Besides the many artisans showcasing their own products, you’ll have the possibility to enjoy a wonderful evening by tasting delicious ice-creams and gelato from the food stalls available. Don’t forget to purchase a unique handmade souvenir that will remind you of this unique town in the heart of the French Riviera. 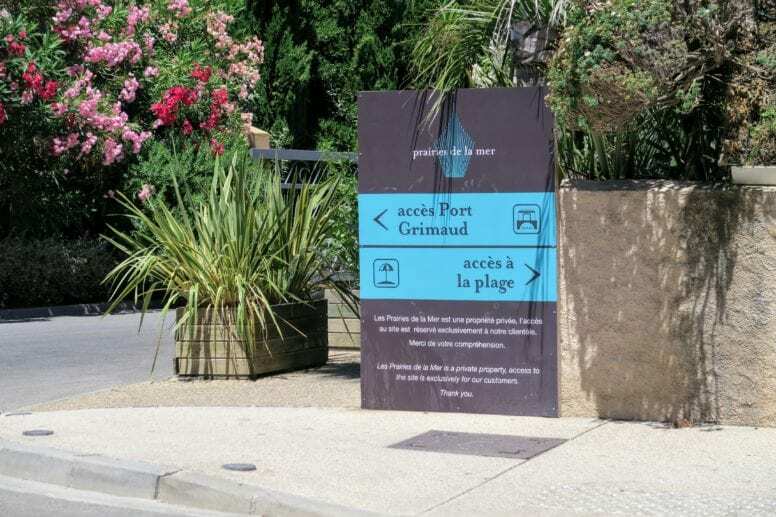 When it comes to accommodation in Port Grimaud, there is a wide choice of different options available. You can stay at one of the lovely hotels where you will have all the comforts and facilities you can think of. Another option is renting a mobile home in a campground – consider this if you want to stay closer to nature and enjoy spending lots of time outside. If you’re traveling with children or/and need to prepare your own meals you could also look into renting an apartment for your family. Airbnb has a wide selection of interesting options so check out their website for the most convenient prices. 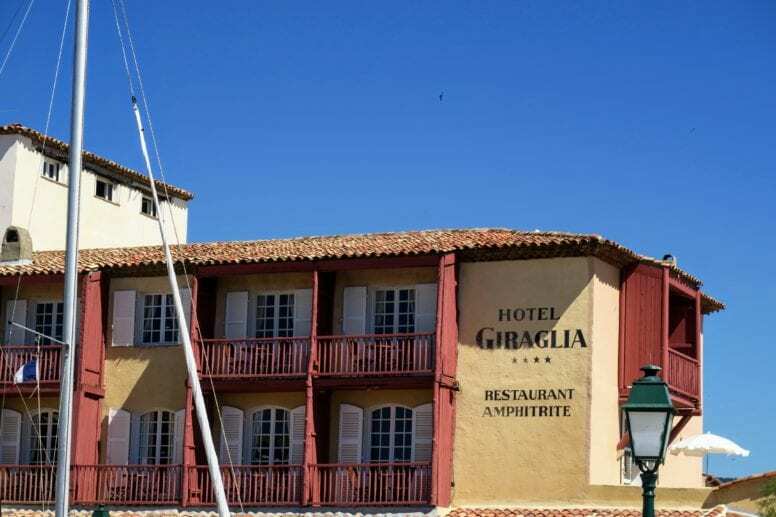 Hotel Giraglia is a wonderful solution for anyone looking for accommodation in the heart of Port Grimaud. Located right by the sea, this hotel features an outdoor heated swimming pool, a restaurant, and beautifully furnished rooms. Many rooms have a fantastic view of the sea and of the beach, as well as a cute terrace where you can have your breakfast or sit back in the evening and enjoy the scenic vista. The restaurant which serves delicious seafood and French cuisine is located next to the pool and is simply perfect for a romantic dinner for two. If you’re coming by car, make sure to contact the hotel in advance in order to arrange the parking space. Les Prairies de la Mer is a 5-star holiday village with fantastic bungalows and mobile homes. It is located only a short distance away from the beach and offers a myriad of sports activities for all the guests. If you’re traveling with children this is one of the best accommodation available in Port Grimaud. Les Prairies de la Mer provides a kid’s club and a playground where your little ones can run, play and make new friends. When it comes to the dining options, there are a few restaurants available on-site but you can also prepare your own food if you want to since all the rooms come with a small kitchen area. Another charming option in Port Grimaud is Hôtel Best Western Signature Collection Le Suffren. It offers lovely, bright rooms in Provencal style that combine comfort and simplicity. If you stay in this hotel, you will fall in love with its colorful furniture and with incredible views of canals and the town’s market square. Depending on your budget you can go for the classic double room or splurge a bit and treat yourself to the amazing suite with a lovely terrace (where you can enjoy their delicious breakfast). If you’re looking for a comfortable apartment inside a beautiful ancient villa you should check out the Appartement Villa Angelina. The apartments available accommodate up to five people so they will be perfect for anyone traveling with family or with a group of friends. Of course, all of them come with a well-equipped kitchen so you can prepare your own meals. There is a beautiful green garden outside where you can relax, while the beach is located only a short walk away. Appartement Villa Angelina is a perfect solution for anyone who looks for a tranquil accommodation in a picturesque setting. One of the best restaurants in Port Grimaud is Rialto Pizza – a cute, romantic place with delicious food and friendly staff. 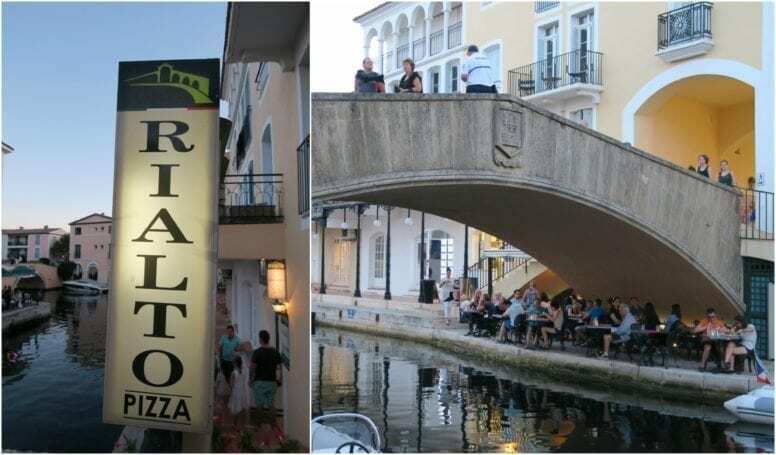 Rialto Pizza is located by one of the canals with some tables situated under the bridge so the amazing atmosphere and picturesque views are guaranteed. The menu includes a wide choice of pizza, salads and yummy desserts as well. During lunchtime, there’s a special menu available with a smaller pizza, salad and a drink at €13,00. The staff there is very friendly and efficient and you will never have to wait for too long to be served. This is a small restaurant with a limited number of tables which means it is highly recommended to make a reservation in advance. If worst comes to worst you can always order a takeaway and enjoy your pizza at your hotel/apartment. La Calypso is an elegant restaurant located off the main center, in a quiet part of Port Grimaud. If you want to rest from all the hustle and bustle and enjoy a nice dinner in a tranquil setting you should definitely consider this restaurant. The menu here is short and simple and includes delicious dishes with fresh and high-quality ingredients. The prices go from 15 to 30 euros, depending on how many entries you decided to have. Don’t leave this place without trying one of their mouthwatering desserts – perfect for lovers of all things sweet and sugary. Another great place for all of the fans of Italian cuisine is Pasta & Via. The restaurant, that’s been around for more than 20 years offers authentic Italian dishes in a nice ambiance and on the top of that with a fantastic view. As the name implies, the menu is filled with all kinds of pasta: spaghetti, linguine, penne, and ravioli are just some of a myriad of options available. There are also a few fish dishes and mixed fried seafood plus a choice of typical Italian appetizers. The waterfront tables are lovely and make a perfect location for a romantic dinner for two. One of the best seafood restaurants in Port Grimaud is certainly La Table du Mareyeur. It is an elegant place, situated by the water with amazing food and excellent service. When it comes to the menu it includes options such as lobster, shrimps, prawns, mussels, crabs, scallops and also a choice of grilled fish. There is also a selection of yummy desserts and an interesting wine list as well. If you’re looking for a high-quality restaurant for a special occasion, La Table du Mareyeur comes highly recommended. Great post and wonderful pictures! I’ve been to Port Grimaud a few years ago with my family and we have amazing memories. I agree that Rialto Pizza is one of the best restaurants, we used to eat there every night! Thanks for your comment Julio. I agree, Port Grimaud is indeed a wonderful place to visit. Port Grimaud seems to be a perfect holiday destination. I’ll certainly try to visit it during my next holiday in the French Riviera. It is a fantastic place, with so much charm!